Derek Willow, one of four kids in the family at the center of this book, really wants to ask his parents for money for a train ticket to visit his friends in his old neighborhood, whom he has been missing since his family’s move to the country. Just when he gets ready to ask, though, the lawn mower dies, and Mr. Willow has no choice but to buy a new one. Before Mr. Willow has a chance to go shopping, though, Derek, his brother Abner, and their sisters, Tate and Celia discover an old lawn mower in the shed that all of them realize has some magical powers. They convince their father to pay them if they can mow the lawn using this old mower, and he agrees, figuring they’ll never be able to mow the huge lawn with such an old, weak tool. While the Willow parents are out looking for their new mower, the four kids take on the unknown magical mower in an effort to earn the cash Derek needs for his trip.The title and cover of this book led me to believe it would be a gimmicky and hokey installment in a forthcoming long train of formulaic series books about magical household objects. I was truly surprised by the high quality of the writing and the characterizations of each of the kids, as well as the family unit as a whole. As in books like Half Magic and Bigger than a Breadbox, the story is essentially realistic fiction, with just one added magical element. The author does a great job of developing the very real financial issues the family faces right alongside the fantastical magical element. I also thought the lawn mower’s behavior was creative and fun. 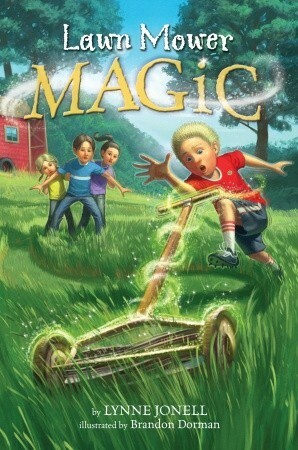 I especially loved the idea that the mower craves grass, and that it moves more quickly the more it consumes.There are a few references in the story to the first book in the series, Hamster Magic, but only enough to make me interested in going back to read it, nothing so cryptic that I was confused or lost. The ending is certainly not given away, nor are the events of the first book necessary to the reader’s understanding of this book’s magic. In fact, that is probably the only complaint I have about the story - that I did not learn where the magic comes from. I suppose the reader doesn’t absolutely have to know that, but I feel like the story set me up so that I would want to know and then didn’t tell me. I suspect, though, that kids are more apt to just accept magic, and it might be that they won’t feel they need the explanation.This quick, illustrated chapter book is great for new chapter book readers looking for magical stories beyond the Rainbow Magic and Magic Tree House series. The writing is stronger than in many series books being published right now, and I hope there will be more volumes to follow. I received a copy of this book free of charge from NetGalley in exchange for my honest opinion.I'm always looking for good middle grade books to get my sons more interested in reading, and since they love Harry Potter, I figured this book would be even better because it has "magic" right in the title! I was unfortunately not really excited by it, though. The book is a nice short one, especially good for kids with shorter attention spans, but there's really no plot to it, and even less character development! The book takes place in one day, when the kids try to mow their large lawn with a rotary mower to save their parents the money of getting a new gas powered mower, in the hopes that Derek will be able to use that money instead to ride the train to visit some of his old friends (the family recently moved to the boonies from the city). Alas, while the mower was sitting in the shed, it soaked up magic apparently from the soil, although I was never really sure about how the magic got there in the first place. When I requested the book I wasn't aware that it was the second one in a series, so maybe all of this was explained in the first book. I just know that I was left with a lot of unanswered questions at the end of the book.Basically, this was a book without a plot, without character development, and with unexplained questions at the end. The kids were likable, though, and the book was short (only 112 pages), so it wasn't a chore to read, but I don't think I'll be reading any more in this series. Not having read Hamster Magic, I didn't understand the references to Derek's family's previous experience with messed up magic. However, I still managed to follow most of the story. The story does focus on one day's events with the children running into a magically empowered lawn mower. I found the idea amusing and the book did not disappoint in that area. The scenes with the lawn mower running amok were funny and entertaining. There is little character development as the book focuses on the events of a single day. The magic is also not really explained. Derek and his siblings are, however, appealing and their interactions realistic. The plot moves along at a brisk pace that is perfect for children making the switch to chapter books. The illustrations are delightful (I love Brandon Dorman's work!) and add a nice note to the book (I do so like illustrations in middle grade chapter books). I recommend this for children who want a light, fun, fast read, who aren't ready for 300 page tomes. Derek wishes there was something exciting to do. He really misses his friends from his old neighborhood. He can't even entertain himself by mowing the lawn because his dad won't let him operate the gas mower. The mower dies on the day that Derek gets an invitation to stay a week with some old friends. With money so tight, Derek knows that he'll never convince his parents to buy the train ticket he needs when they really need a new lawn mower instead. Then, Tate finds an old push mower in the shed. The children discover that the mower is touched by the "burrow magic." Its blades start whirring every time they touch grass. Keeping the magic a secret, Derek gets his father to let him finish the lawn with the push mower. While their parents go to town, Derek begins mowing. When the magic mower begins devouring everything that's green, all of the children must work together to minimize the damage and get the mower to stop. The book is a rollicking good read. EARC provided by Edelweiss' Above the Treeline. The Willows have moved out to a somewhat remote house with a fair acreage. Derek misses his friends at his old home, and wants to get a train ticket and go visit, but money is tight. When the family lawn mower dies, Derek and his brothers and sister find an old rotary mower in the shed and start to tackle the huge job of mowing. It's much easier when they find that the mower is magic, and it happily drags them all over the yard, as well as over some hedges. Can Derek keep the lawn under control so the family doesn't have to buy a new mower, and he will have enough money for a train ticket? Strengths: The second in a series (Hamster Magic is first) this was a fairly amusing Stepping Stone book vaguely reminiscent of the work of Ruth Chew. Since I have a rotary mower, I had to read it. Weaknesses: Too young for middle school, and very weak on plot. Going in, I wasn't aware this was the second in a series. I was just excited when I found a galley with illustrations by Brandon Dorman, since he is one of my favorites. I also knew of Jonell's work for middle grades and had heard great things, and the publisher's blurb likened this to Junie B., so really, where could I go wrong? Well, I'll tell you. This would be a cute picture book, especially with illustrations by Dorman (which I missed because most of the art wasn't final in the galley ), but there isn't enough plot here for an engaging chapter book and it certainly isn't similar to Junie B. I would be interested to see how well-recieved Hamster Magic was by students before purchasing this one. This is actually the second book of a series - I wish I would have known! I would have read the first one first (I have since listed it as a series on this site - it wasn't listed as a series before, that's why I didn't know).I checked the book out to see if it was one I could use at school and it sure is! Which is great! It's a book I actually enjoyed and can use at school. Those are rare ;-) I hope the author continues to right more of these books so I can have even more books at my disposal for school.The story was kind of cute. How would you handle a lawn mower that could move on its own and had a huge appetite for grass? The four siblings show great "sibling-ship" and work together as a team to overcome the lawn mower that's a bit out of control. But wouldn't it be fun to live on a hill full of magic? Lawn Mower Magic is the sequel to Hamster Magic.The Willow family move to a new house near the hill. Derek receives an invitation to a birthday party but their parents don't have enough money to buy him a train ticket because they need to buy a new mower.The four siblings find rusty, old-fashioned mower in the shed and they ask their dad to let them mow the lawn so he can afford to buy Derek a ticket for the birthday party.Abner, Tate, Derek and Celia(and Mr. Bunny) have to mow the lawn until the end of the they, but thet don't know that Mowey is magical...I liked the story. It was very enjoyable. Lynne Jonell's writing was flawless. Thank you Random House and NetGalley.Two Thumbs Up For Mowey!!! Following the Willow children from Hamster Magic, Lawnmower magic is a very quick read for beginning chapter readers. There is little character development and a very thin plot. The siblings find a push mower in the garage and mow the grass with the "magic" mower while their parents are gone for the day. A marginal purchase, if you wanted to add a second book to follow up the family from Hamster Magic. Another cute story about the Willow family who moved to the country. Derek, the middle child, misses his friends back home and wants to attend a birthday party back home. He and his siblings find a magic lawn mower in the shed so Derek makes a deal with his parents that if he can get the whole lawn mowed before they get home he can go back to visit. This story is has more magic than the first but is not over the top. The Willow's lawnmower just broke, and now they are planning on buying a new one. New lawn mowers are really expensive, and Derek wanted his parents to lend him some money, so he a train ticket so he could go visit a friend. Derek, Abner, Tate, and Celia try to fix the old lawn mower so his parents won't have to buy a new one. Read this book to find out what happens next.I love this book! I is great. You have got to read this book! This is a book for 1st and 2nd graders who are just beginning chapter books. I found the writing level right on target for these ages but felt that the "Magic" fantasy part was a little less than exciting. Maybe it would excite this age group to have a magic lawn mower. I was just excited when the book finished. My Kindergarten son loved this as a read aloud. We read Hamster Magic (Book #1) together a few weeks ago. He was excited to find out that book #3 is in the works: Grasshopper Magic.Recommend this series to your Magic Tree House fans. Series: Magical Mix-Ups #2May be best for ages 5-7? The lawn mower went out of control when they took it out from the shed.It was pretty big adventure. its about Abner's dad's lawn mower brooke so he finds a old lawn mower that's been sucking up magic.when he turns it on it goes crazy.so he has to figure out how to stop it. The sequel to "Hamster Magic". This was a cute book about a possessed lawn mower. Fun early chapter book with just a touch of magic that creates quite a challenge for the Willow siblings. Who would have thought that a lawn mower could be such fun? A magical lawn mower is exactly as lame as it sounds.